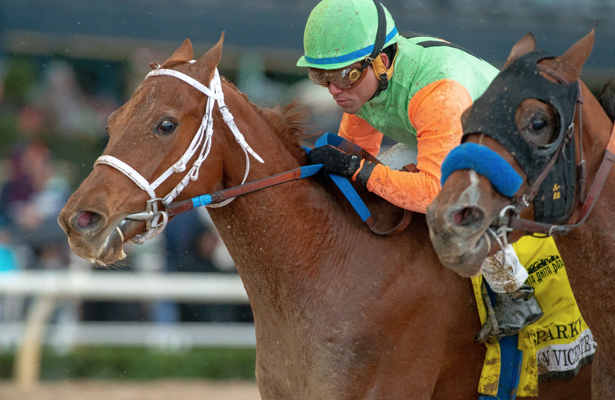 In a race that looked to be decided at the top of the stretch between the Bob Baffert trainees Dessman and Coliseum, Sparky Ville stole their thunder, coming with a late charge in the slop to win Sunday’s Grade 2, $200,000 San Vicente Stakes at Santa Anita Park. The 6-1 shot, trained by Jeff Bonde with Joel Rosario in the irons, saved ground through the turn, swung off the rail in the stretch and chased down debut winner Dessman just before the wire. Sparky Ville prevailed by a nose, while another 6 1/2 lengths separated the Top 2 from Coliseum, an odds-on favorite in the field of five. The winner, by Candy Ride, covered seven furlongs in 1:21.93. "We were very happy with the way our horse had trained for this race," said Bonde, who trains for Del Secco DCS Racing. "But it's always scary when you have to look at those Baffert Maseratis." The chestnut gelding entered off a turf stakes to end his 2-year-old campaign, running sixth in the Eddie Logan. Three races back, however, he became the only stakes winner entering the San Vicente by scoring at 6 1/2 furlongs on the main track in the Sunny Slope. Bonde anticipates continuing to run Sparky Ville at seven furlongs to a mile. Meanwhile, the experiment will continue with Coliseum, a Godolphin homebred by Tapit who blitzed to a debut win but hasn’t backed it up in his ensuing two starts. He managed to beat one runner out of the gate, stalked Savagery through opening splits of 22.07 and 44.32, but offered nothing late under jockey Mike Smith. Notoriously headstrong, Coliseum donned a Citation bit and bridled with a strap down his face. “He certainly respects his Citation bit a whole lot more than he would, of course, the other one,” Smith told TVG before the race. “If you need it, when you pull back on it, it has a little lever that will come up and hit the top of their mouth. They really have a lot of respect for it. Behind Coliseum, Synthesis and Savagery rounded out the finishing order.